The EcoHitch® hidden hitch for the 2017-2019 Subaru Impreza is made from high-impact powder coated aerospace grade aluminum, stainless steel and steel. Rated for 525 pounds tongue weight and 3,500 pounds towing weight, this hidden hitch for the Subaru Impreza hatchback is full of personality that complements your car. *If you’re going to be towing and need trailer wiring, click here! Ensure your wiring harness does not drag on the ground by visiting our Eclipse trailer wiring bracket page. Making the most out of every mile, your Subaru Impreza needs accessories that will be able to keep up with your needs including this Impreza trailer hitch. With this Subaru EcoHitch, we have manufactured a perfect trailer hitch that allows you to maintain all the luxury you love on every day’s journey. The EcoHitch® hidden hitch for the Subaru Impreza hatchback comes in a 2-inch receiver size so you get a wide variety of bike rack and cargo tray choices that will work best with the 2” receiver opening. 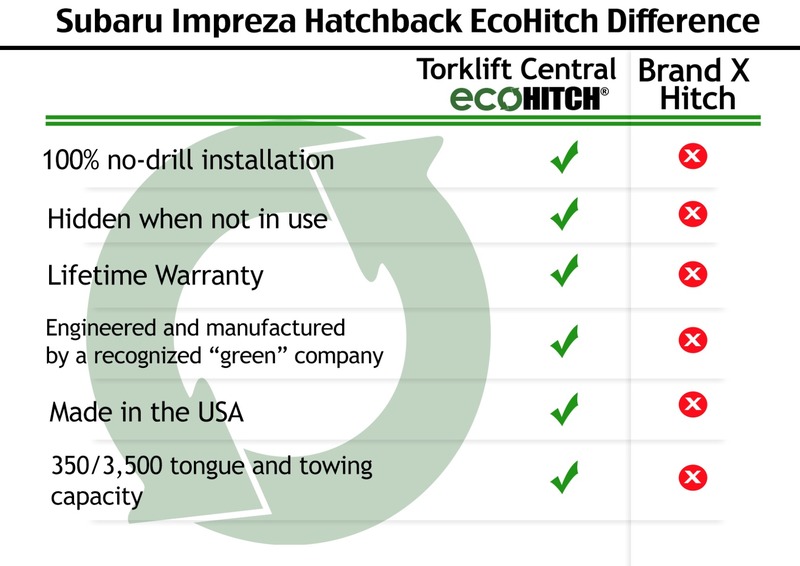 With 525 pounds tongue weight and 3,500 pounds towing weight capacity, our EcoHitch for Subaru Impreza will give you the ability to have an amazing ride in your Impreza without conceding efficiency or style. The Subaru Impreza EcoHitch makes it so you can take your bikes, extra cargo and so much more!